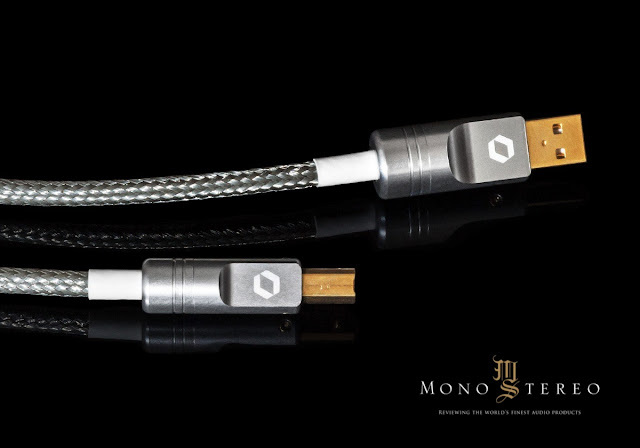 "For the first time ever, a unique characterized USB cable is available and we are able to classify the performance level of the cable with individually measured data.For our professional USB cable, we have selected the finest materials available to provide durability and best performance possible." Best-in-class signal transfer: Impedance controlled design, double shielding and stronger power lines. Individually characterized. Our goal was to develop a professional USB 2.0 Hi-Speed cable for highest demands in data and media transmission. 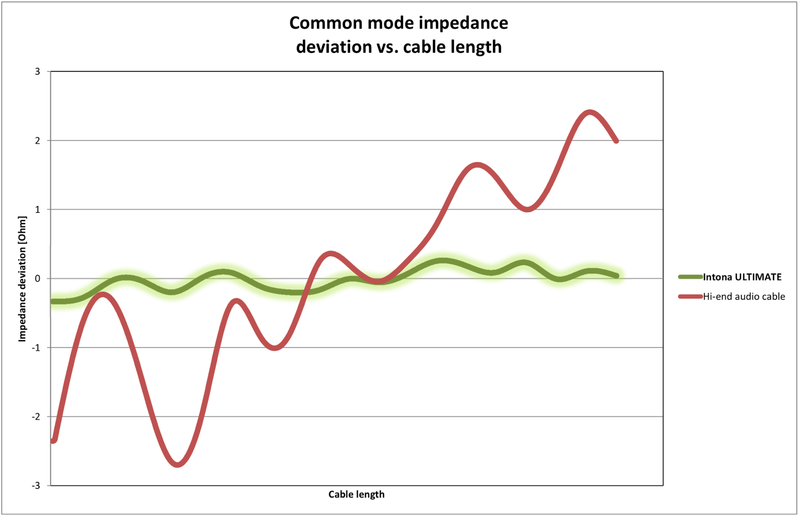 Constant Impedance vs. cable length. 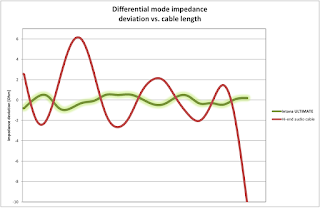 The ideal USB cable shows an absolutely flat impedance vs. cable length. 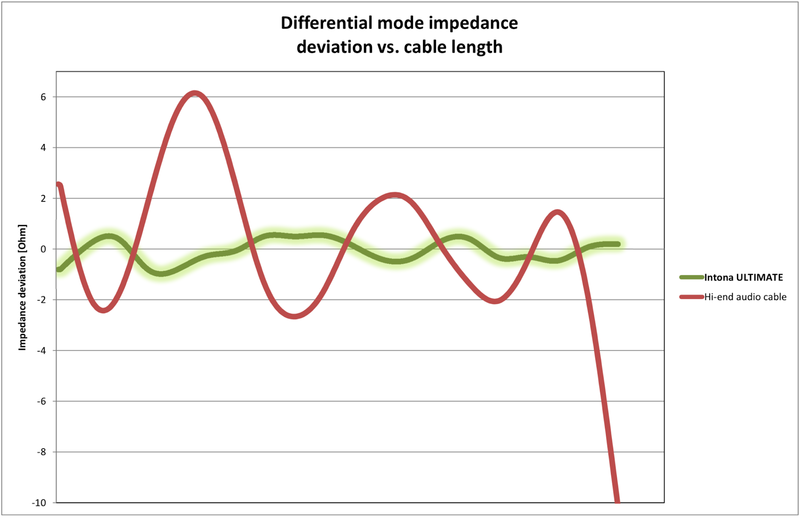 But unfortunately reality is different and all wires in the market show significant impedance variations over length – even in a single production lot. Where ever there is a change in the impedance, there is a reflection of energy. When these returning energy reflections meet with other imperfections, some of the signal recoils in its original direction and creates multiple echo effects. These echoes reach the receiver at different intervals and make it very hard for the receiver to detect data values on the signal in an error-free way. 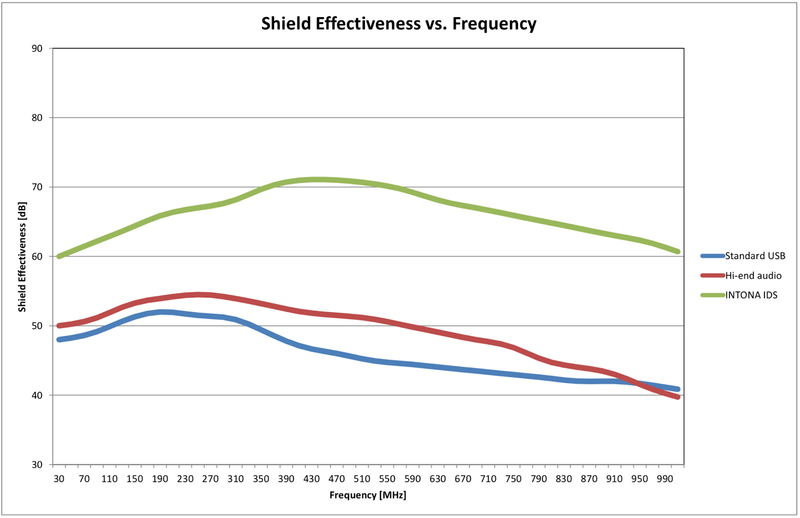 The effects out of this process can be very similar to those of jitter – the natural, audible enemy in any audiophile HiFi-system. The deformations caused by these echoes can also be cleary seen in the signal eye pattern. Before our cables get assembled, we are using our own Vector Network Analyzer to measure and analyze the raw cable. Following the results of the measurement, we are already sorting out parts of the raw cable, which simply don't meet our internal quality standards for impedance continuity. We are sourcing the raw cable from a german supplier on a very high quality level and of course all parts of the cable are originally fully compliant to USB 2.0 specs but our goal is to build an even better cable. In other words: we are disposing parts of the raw cable, that other suppliers would love to use! One thing is common for all three grades: our internal requirements for impedance continuity are much more demanding and narrower than the original USB 2.0 specifications! 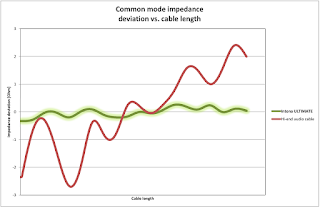 The following charts show a representative Intona cable out of each performance level compared with a Hi-End USB 2.0 audio cable, which has an excellent reputation in the market. Compared with obviously one of the best cables out of this market, each Intona cable is able to show a significant improvement in terms of impedance continuity vs. cable length and thus a dramatically improved reliability and signal integrity. For ultimate signal integrity and the most reliable data transfer. The shielding quality of any cable depends on the external conductor's characteristics, which prevents the exchange of electromagnetic waves between the cable and the external environment. Electromagnetic Interference (EMI) can seriously disturb and / or disrupt the proper operation of any electrical equipment. In all applications, where a bit-perfect data transfer is one of the top priorities, the best cable shielding is indispensable. Cables can be a main source of transfer for EMI, both as a source and receiver. As a source, the cable can either conduct noise to other equipment or act as an antenna radiating noise. As a receiver, the cable can pick up EMI radiated from other sources. EMI noise can arise from various sources such as heavy motors, generators, relay controls etc. but even placing signal cables next to power cables can also allow power-line noise to couple onto the signal lines which means a serious disturbance of any data. The inner shielding consists of a carefully designed material combination (synthetic/metallic laminate plus braid) which already provides a 100% coverage of the conductors. The additional unique outer shielding consists of a braided wire with finest filaments made out of tinned copper. With this shielding technology Intona Technologies has created a USB 2.0 Hi-Speed cert-ready cable, which provides the best possible protection against ESD, RFI and EMI and highest possible signal integrity. In order to provide the most reliable and stable 5V power supply for any external device, we are using stronger power lines compared to other cables.